From INTERSTATE 10: Exit at Crestview. Highway 85 South to Niceville. 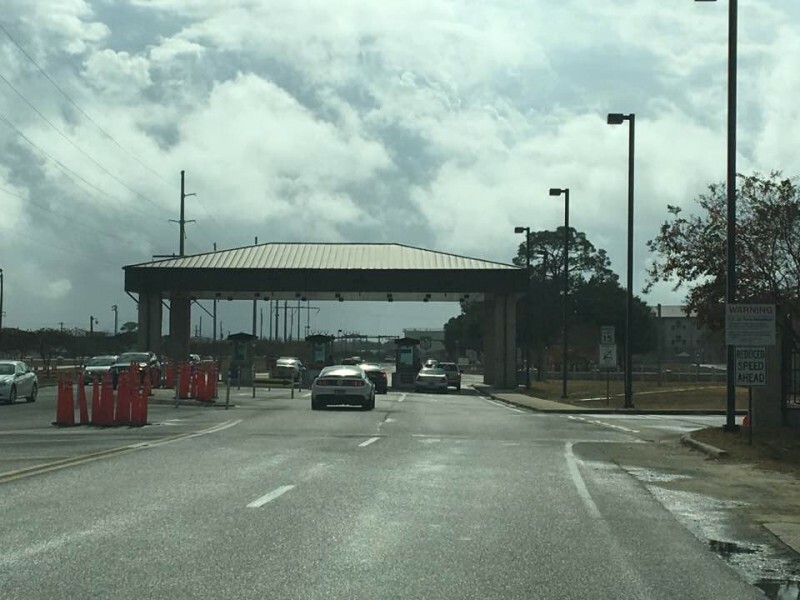 West (right) on John Sims Parkway (SR20) to the East Gate of Eglin AFB. From East Gate go straight on Eglin Blvd. past hangers then bear left on Memorial Trail, follow signs to exchange/commissary. Turn right on Shambo Cove. First two entrances are the Famcamp (signs on the left just prior to the exchange/commissary). Check-in office at Camp Robbins campground. 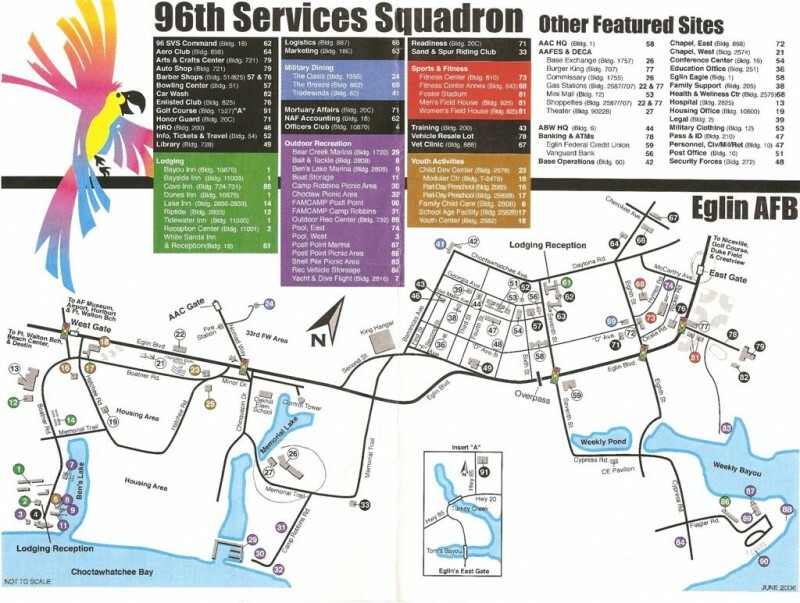 -- From HIGHWAY I8: In Ft. Walton Beach, North on Eglin Parkway to the West Gate of Eglin AFB. About a mile past the gate, turn right onto the John Sims Pkwy/Eglin Blvd. (Hwy 397). Turn right onto Chinquapin Dr. Turn left onto Memorial Trail, as if going to the exchange/commissary. FamCamp signs are on the right past the exchange/commissary. Check-in office at Camp Robbins campground. -- To Postil Point: From East Gate, turn left on 8th street. At the stop sign, turn left then left again on Flagler RD. Once reaching the beach parking lot, continue straight to the opening of the Famcamp. 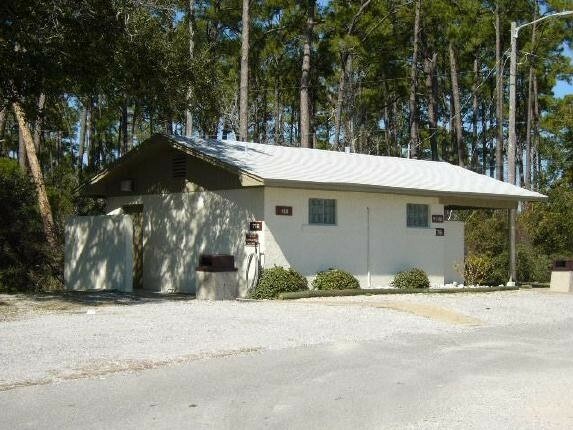 732 Flagler Road, Attn: FAMCAMP, Eglin AFB, FL 32542-5000 ---- Personal Mail cannot be sent to FAMCAMP office. Not accepted for the RV Park. 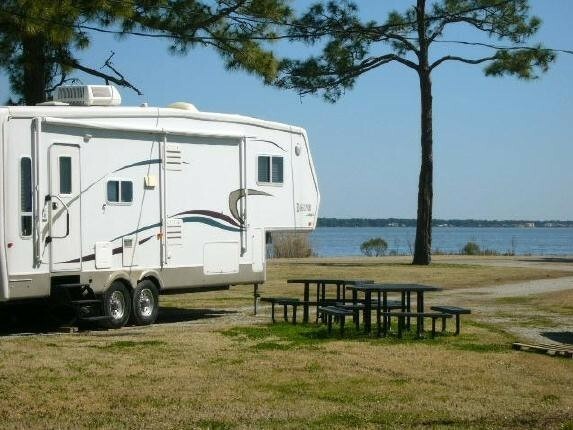 However, reservations are accepted for the on-site rental RV's. No Internet available at sites in either RV Park. Limited WiFi available at Camp Robbins office and ODR. Allowed with usual leash and clean-up rules. Animals cannot be left unattended outside. 180 day stay limit. Guest must vacate for 72 hours before returning. 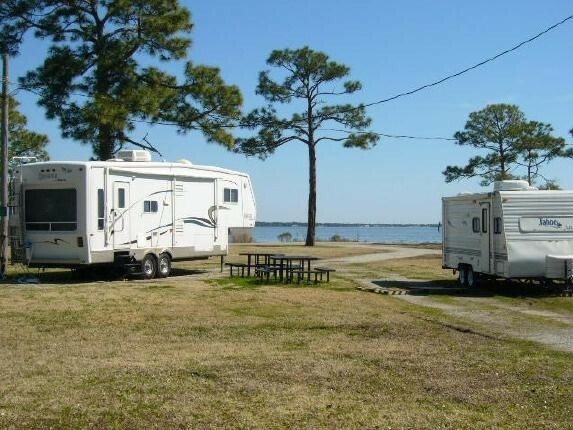 Eglin AFB FAMCAMP is actually two campgrounds: 1) Postil Point campground is on the bay at sea level. Partial hook-ups include 30/50A, Water and Cable. A sewer dump station is available. Spartan, but clean bathhouse and laundry. 2) Camp Robbins is in a rustic setting within walking distance to bay, BX/Commissary. Hook-ups include 30/50A, water and sewer. Bathhouse and laundry in modern building. Guest may only have 3 items on their site, such as 1RV, 2 cars or 1 RV 1 car and 1 boat. 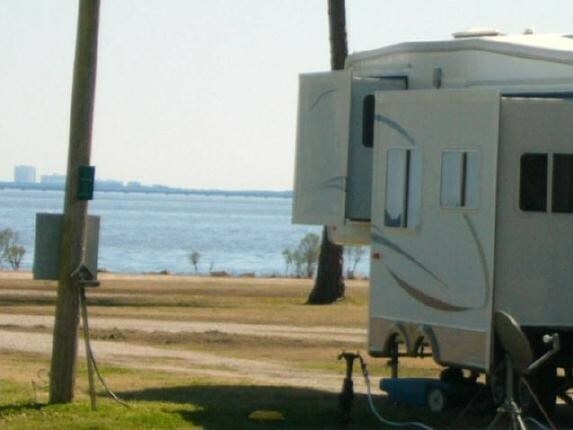 Guests may have a tent in a RV space, but normal RV fees are charged. Lower monthly rates are from May - Sep.
USAF Frequent Camper Coupon Accepted with 3 Night Stay. Propane available at Camp Robbins location. 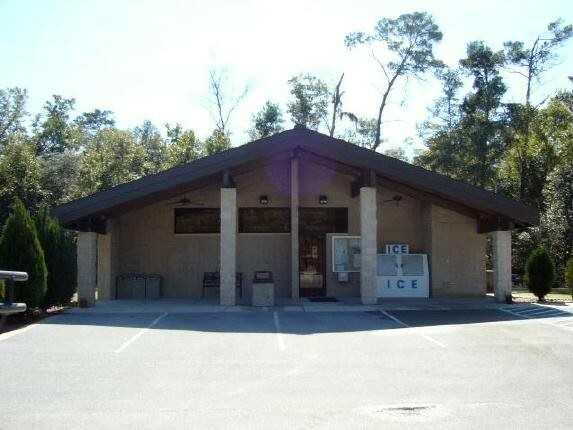 Bar/Club, Base Info, BBQ Grills, Boat Slips, Cable TV Camp Equipment Rental, Camper Rental (onsite), Recreation Equipment Rental, Restrooms, Shopping, Sport Fields, Tennis, Volleyball, Water Sports., RV Storage lot. The rules have changed. Currently the rule is first come first serve but management is holding slots for Tindal AFB displaced persons. There is still a 180 day limit (paid month to month) with a 30 full days off and you can NOT return to the same site you left. They are holding some sites (between 4-8) to a 14 day 'reserved' plan but the sites seem to change daily. Reservations made through management by phone. Best to call management for current rules and occupation plan. I currently reside in this park. We were thankful to be able to get a camping spot at Robins when we arrived. The campground was full the whole time we were there, it appears that people have figured out how to work the system to save spots by placing a tent in the spot to hold it but never occupying the spot until they return. Also notice tents were being allowed to rent RV camping (concrete) spots. Many folks with RVs would come in looking for a spot and find numerous spots with pop-up tents with no occupancy that were being saved. 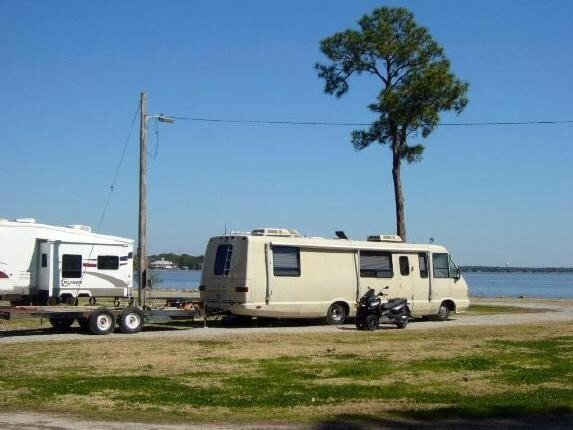 All other Famcamps I believe require the RV with occupants to be there. Not sure if there is any priority system applied for Active Duty, Retired, or DOD Employees. Also, not sure how DOD contractors fall into this priority. Campground sites were larger than average sites and there were no issues with electric, water, or sewer. Wish they'd spend some funds to pave the roads, or fill the pot holes. Unfortunately I would not call this a clean campground. Pet owners are advised upon arrival to pick up their pet droppings, however we observed several folks ignoring this requirement. In addition, we noticed a lot of pet droppings while walking around the campground. The area around the trash dumpster was very trashy, to include box springs, pallets, bedding, etc., which were dumped outside the dumpster. These items were not picked up the whole time we were there. We did not see any staff checking the campground for rules being followed or any other issues like the dumpster, etc. It appeared that the campground was under staffed, and we didn’t notice any maintenance or cleanup being done. 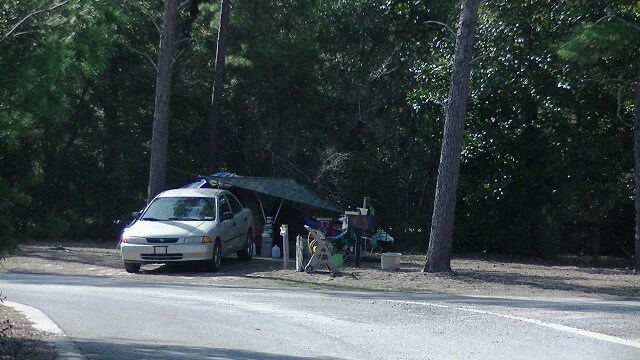 Finally it appears that people have figured how to stay in the campground for lengthy stays, more on a full time basis. 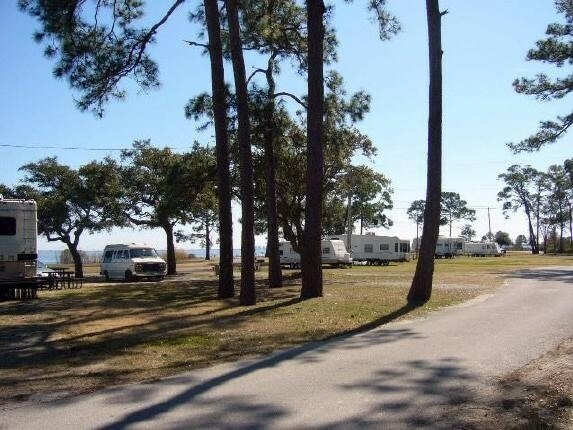 This campground is conveniently located and has the potential to be a beautiful campground. We tent camped at Postl Point for a week. There are two tent only sites located next to the small lagoon, just before exiting on Desoto Circle Road. I would recommend against tent camping on either of those two sites. Rent an RV site closer to the beach and camp there because the no-see-ums will eat you alive if you pitch a tent at one of the tent only sites. Otherwise, it is a great location being right on the beach. The only other problem was the RV that was parked on the last site before you exit Desoto Circle. The couple that resides there believe that one-way signs and speed limits do not apply to them. Additionally, their site (and several others) are messy and give the entire RV site the look of something out of Deliverance. We landed at Eglin in Dec 16,and didn't depart until the end of Feb 17. 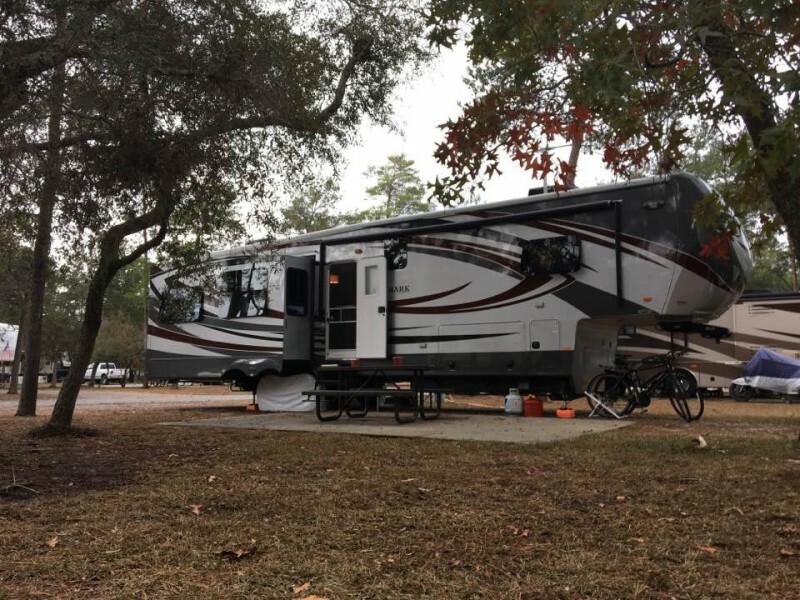 This was our first full-time winter stay, but not our first rodeo staying in an RV park. We've been RVing for 20+ years. Campground is nice with larger than average sites. No issues with electric, water, or sewer. Wish they'd spend some funds to pave the roads and add more FHU sites. 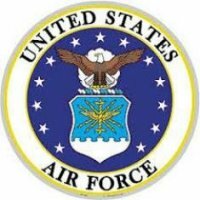 The sound of freedom waking you up is welcomed by most veterans, but be aware your on an Air Force base and the campground is at the end of the runway. Shower house was clean with good water pressure. Maintenance on the shower house took longer than it should have. Handicapped shower head broke and it was not fixed 5-days later when we departed. Laundry rooms were in good repair with 4-each washers and dryers that cost $1.25/load. Staff was mostly friendly and they were always responsive to Facebook communication. This was very important because the phone system didn't work to contact the office the entire time we were there. So broke in fact, you couldn't even leave a message for the staff. This is a known problem MWR has failed to resolve. Contracted management also doesn't care for the campground as well as others we've stayed at that empowered camp hosts to be the local presence. There was trash littering the sites that persisted until a camper picked it up. I spent the entire stay policing cigarette butts left behind by previous occupants. The waterfront area is a work in progress. It's getting better every week thanks to efforts of CE workers. They've been cutting back grasses to allow access to Choctawatchee Bay. Walking and bike trails nearby are in need of repair. Cut trails were nice, but paved areas were in need of repair due to heaving and large cracks. I believe the price exceeds the value of what the campground offers. 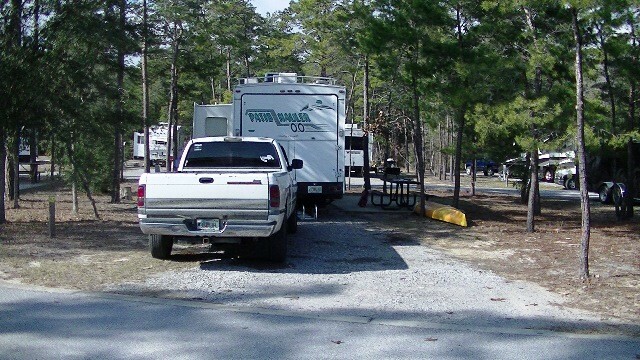 There were no planned activities, even during holidays, there is no central clubhouse or like venue in either campground, there is no WIFI throughout the campground (you can get WIFI if you go sit in or near the office), no fire pits or campfires allowed, and no cable option. This was simply a decent place to park with FHU available. I'd expect a park of this type to run $30/night or $375/month. One major drawback is no reservations allowed. This is a first come, first served park. It's even more troublesome because of all the homesteading folks due to lax stay policy. 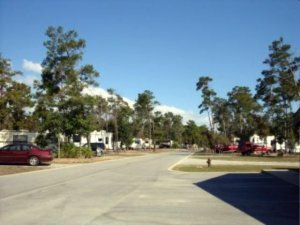 Folks are turning Eglin into a family housing area. Forcing a departure for 10-days is a ruse because residents call a buddy to pull in as they pull out, so they can swap back when the minimal time period has passed. We saw at least four different rigs due this to keep their spots. Issues related to the homesteading movement make it difficult to get a spot and folks seemed to keep to themselves more than you'd experience in parks with more turnover. Staff was very courteous. I stayed at postl point. I had to move from my first spot due to soft ground. The sites are not laid out well. Electric and water only. The view is spectacular. The price has jumped to 25 dollars a day, which i feel is high for a nonprofit setup, that hasn't had improvements in a long time. Office personnel were very courteous and helpful. Location and RV Sites are excellent. Could not contact the office because the phones did not work, there was no change in the change machines at the laundry mat, cleanliness of shower/toilet facilities were lacking, especially at Postal Point camp ground. Well we're back again after a couple of years. Stopped by for a couple of weeks to rest from traveling up north. Need some sit still and quiet time. Got it here, except for the morning and evening jets. Well, I still like this FamCamp! Plenty of sites to choose from. Great people, Full hookups (all of them). Very quite except for the sounds of freedom. Will certainly come here again. Laundry worked and was clean. Commissary and Exchange right down the road half mile. Dining out not too far to town. Had a real good time here. It is back to check-in at Camp Robbins for it and Postal Point rv camps. Hours are 8 to 3. Everything else seems to be the same. Nice bike/running path for quite a ways (from Camp Robbins). Nice Exchange and Commissary. Good choice in the food court. No diesel at the gas stations. West gate seems to be the best entrance. Trying to find East Gate was a HORROR! The directions say to stay on SR20 but it ends and becomes FL397. No mention at junction about East Gate only sign to North Gate. So didn't know where to go. Then directions say to go onto 85, which takes you past the North and West Gate. Finally went in the Commercial Vehicle gate and got the final directions to the Famcamp from security. Just went straight ahead on Escambia (truck route) to Eglin Blvd to famcamp. When I tried calling all morning to the office no one answered. Finally called the Outdoor rec office just to find out if they had spaced. Nightmare! Another great two weeks at Eglin! Once again, we stayed at Postl Point, never more than 75% occupancy, but it was obvious that three or four were full timing. Weather was great except for two storms that blew through, temps averaged right around 89 degrees, but most of the time we had a breeze to alleviate the heat. The grounds were still maintained nicely and the showers/bathrooms were always cleaned daily. The only possible downside was that the office closed for two weeks without any prior notice, just note on the door that they would be closed and if anyone needed LP, they gave the number for Outdoor Recreation. Not really a big problem, we had no campsite issued and since we wanted to extend our vacation for another week, we just used the drop box. Definitely a great spot to camp, can't wait until next year. You just can't beat walking out your front door every morning and looking across the bay! R.L. left this review using the Directory software: - We stayed at Camp Robbins and its one of our favorites so far. We probably would still be there but we had reservations at Panama City. We enjoyed the well spaced sites with the largest concrete patios we've seen. We checked in on the heels of a big storm that had knocked out power in Mary Esther and downed a lot of trees. The park had several trees down, including one that landed on a Class A motorhome. Not sure if that had anything to do with it, but the girl who checked us in was not very efficient. Apparently they have a new computer system and she couldn't give us our frequent camper discount. The office/lounge area is one of the nicest we've seen. Excellent library. Did not use the bathrooms or laundry but the building looked very nice. The setting for the office was well landscaped and attractive but as it's located at the very back of the camp some signage would be helpful. There are 2 driveways into the park. Some signage here too would be helpful. Would definitely stay here again. We were not impressed with Postal Point. Even without it's being mostly under water when we drove through the sites seemed oddly placed and not too appealing. There is a serious lack of signage for the FAMCAMP The directions are correct, you should follow the signs for the Commissary-Exchange. When you get on Memorial Trail headed toward the Commissary-Exchange, you will round a right curve then you need to start looking for Shambo Cove Rd on the left. There is a sign board that points toward the FAMCAMP but you must look for it. Next lack of signage is there is NO obvious sign for the FAMCAMP entrance. Once on Shambo Cove look for the second road which is marked with white rocks that are supposed to read FC. This is a good entrance to the park. There are no signs in the park but if you drive straight in toward the back of the park, the office is located at the end of the road. Hope this helps! 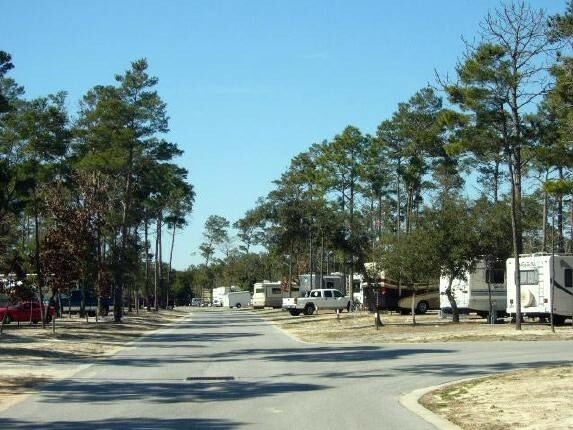 Camp Robbins (Eglin FAMCAMP) is still a really nice campground. We stayed in one of the 3-day sites. We were on our way to Arizona and stopped here as we have been here before. There are 3 of the 3-day sites they keep open for those travelling through. I asked the staff if I could have an extra day and they said no problem. Although, any more than that and I would have to move. The campground was full this time of year with the snowbirds. We really liked how dark it is at night, especially when you remove the light bulb from the power box. Keep in mind it is their busy time of year so you may not get a site. There was a guy waiting for our site when we were packing up to go. We did not use the bath house or laundry so I cannot comment. Still a really good FAMCAMP for $20 per night. Camp Robbins is a beautiful campground, nicely spaced, wide, long and level spots. Had no trouble with my big rig. 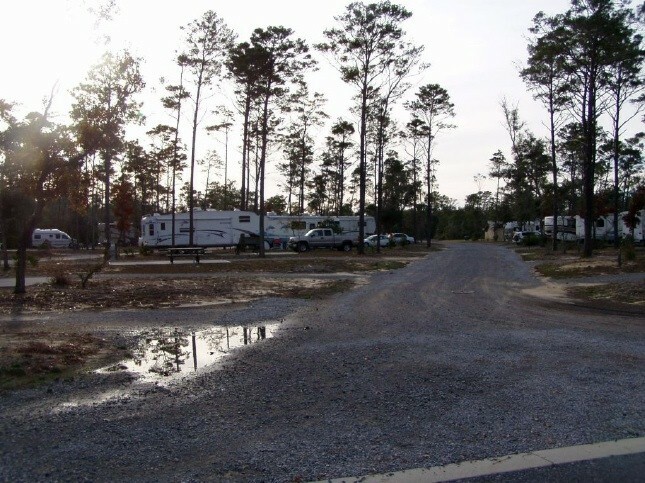 The campground is close to everything, PX, Commissary, Starbucks all within walking distance. The staff was excellent except for not wanting to pump propane on cold days. Had to drive to Postal Point Campground to get it. Washers and dryers were very clean but a bit pricey $1.75 each. Restroom and showers were very clean. Lots of hiking trails, had lots of great walks through and around the recreation area. Ticks were a problem for the dogs but they loved the trails and the waterfront. Will be back next season. Thanks Eglin, keep up the great work. An enjoyable short stay at Camp Robbins. The campground was only about half full (same at Postal Point). 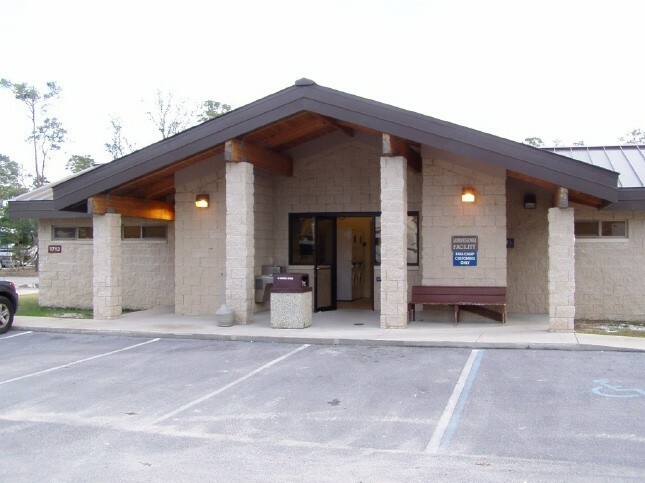 The Camp Robbins office hours have changed to 0900-1500, M-F, closed Sat and Sun. Don't know if that's just for the Summer season or a permanent cutback. Also, the FamCamp no longer offers a 10% discount for using a Services credit card. As others have noted, would be nice if cable TV was available. We were able to pull in 12 channels with the crank-up antenna, but reception was not consistent due to interference from fairly constant air traffic (same interference for the Wi-Fi caused repeated loss of signal). By the way, if you love the sound of freedom, you'll enjoy it to your heart's content with all the activity at Eglin, especially with the F-35's in the pattern. 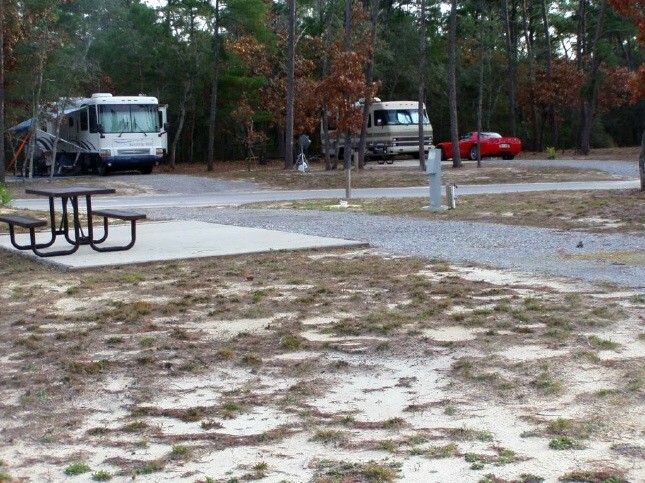 This is a very well kept campground with well-spaced spots and lots of room to maneuver (we camped in a 38' 5th wheel). 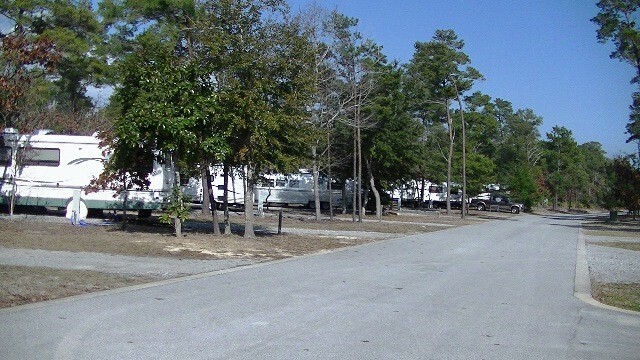 The campground is very convenient to the BX/Commissary, as well as a great springboard location to attractions in Ft Walton Beach and Destin. If you camp here and haven't been to the Air Armament Museum, you don't want to miss the opportunity...it's just outside the East gate. Another great stay at Postal Point, weather was great, the view was as beautiful as ever! This visit, Postal Point stayed fuller than it was the same time last year, completely full the last five days of our stay, Camp Robbins was only about half full while I was there. It looked to me that word has finally gotten out that Postal Point now has 50 amp service since 5 of the campers were in the big rigs. The grounds were immaculate and the bathhouse was kept very clean the entire time. A couple of negatives: There were two campers that were obviously homesteading. From the start, it was clear that the new camp manager was holding at least one spot for friends of friends. The spot we wanted was taken, but when we asked for the spot next to it, she told us it was also taken, but it stayed vacant for the first three days. When the second camper finally appeared, both sites held a small party and the manager was one of the guests. A small gripe, I know, but it irritated me that some people are allowed to reserve spots while most people aren't. 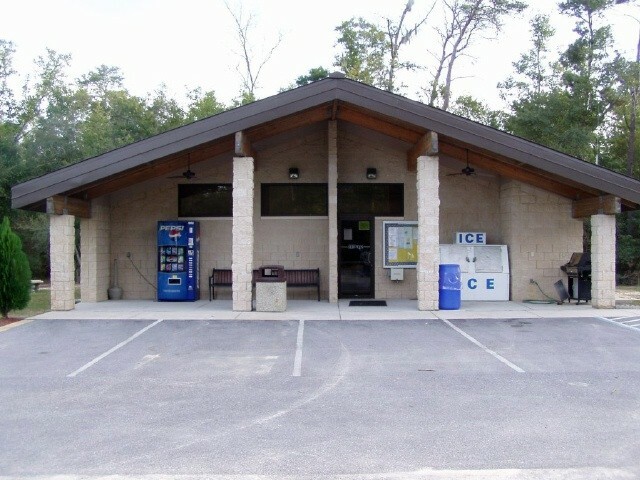 The people at the Outdoor Rec Center were absolutely great, and it's location is super convenient in case you need drinks, snacks or ice. The boat rental was smooth and efficient. I know it's not part of the campground, but the military beach has cut back on open days. Last year it was open 7 days a week, now they're only open Thursday through Sunday. Some said the sequester was to blame, I don't really know, but it's a shame because it's so much nicer there than the public beaches. Still, all in all, a great camp and a good time. I do plan on going down a little later next year (the water was still pretty cold this time) and see how things are then. We didn't stay here but took a field trip to check things out. In the past my opinions have been mostly negative. On this trip I must say that this place has changed so much that I may in the future consider coming here even though I like to have a confirmed reservation and they don't take reservations here. There were no sites that looked trashy and they appeared neat and clean. A big improvement from my last visits. I counted 26 vacant sites and this was the week before Easter. We drove out again the Tuesday after Easter and also counted 26 vacant sites. Postl Point only had one site but I probably wouldn't stay there. So. Overall, Eglin Famcamp is looking good. Enjoying our stay here.... Laundry/restrooms are nice & clean. Wi-Fy isn't working...struck by lightning a few weeks ago & not fixed yet. CG about half full, sites not too level but OK, mostly pull thrus. I like the concrete picnic table & pad. Nice trails around base. Will stay here again if in the area. Plenty of room to move to maneuver around CG. Stayed here in a 39' 5th wheel. My daughters (8 & 11) and I tent camped here. Camp ground was lightly populated (guessing less than 50% of RV spots were occupied - total of three tents up including ours). Bathroom and laundry facilities very good/clean. Excellent trail, dirt road, and biking/walking paths on base for kids. Not much just outside the E/W gates. The air museum is great. Intended to stay at the campsite, but since it was a first come first served affair, I did not want to take a chance and not have room. So I went and stayed at the Army RV park in Destin. One recommendation I would make is for Eglin to accept reservations. If I could have made reservations, I would have stayed on Eglin. As it turned out, there was plenty of space available, even though when I have called the folks at the desk said that it was the "snowbird" season and it would be busy.